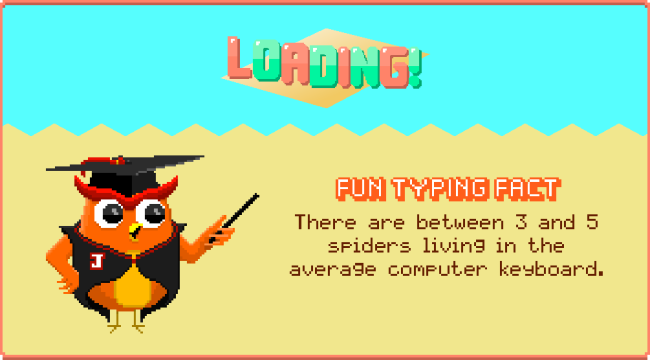 One of many loading screens for Icarus Proudbottom Teaches Typing. It’s impossible to accuse Icarus Proudbottom Teaches Typing of false advertising. After glancing at the title, you’d expect to find a goofy take on the earnest but dated educational games of yore like Mavis Beacon Teaches Typing, Number Munchers, and maybe even The Logical Journey of the Zoombinis. And that’s exactly what it is. Teaches Typing is a lunatic 15-minute send-up of those games, but wisely avoids the obvious gags and clichéd attempts at “game humor” in favor of genuine comedy and borderline brilliant gameplay devices. Quickly racking up praise from Kotaku, Rock, Paper, Shotgun, Giant Bomb, Destructoid, Indie Statik, and of course, MTV, the game has given Brooklyn-based Holy Wow Studios (aka Dan Vecchitto and Jaclyn Lalli) their first blast of meaningful game press. Yet there’s one small problem. Teaches Typing was a month-long jam game that was essentially a vacation from their main project, the much more ambitious Icarus Proudbottom Starship Captain. That game is not a typing game. It doesn’t share the former’s intricate subversion of its genre. And it’s still far, far out from release. Facing these constraints, how could Holy Wow harness the goodwill from Teaches Typing to help drive the community for Starship Captain? Is there a way to parlay their already buzzworthy game into financial success? What’s an indie developer to do? Note: After talking to the developers, I’ve condensed some of their decisions and experiences so far into indie development tips scattered through this article. While the advice may seem obvious, sometimes it is the simplest truths that we have the most trouble accepting. While Vecchitto and Lalli have been making games for years, some of their earliest feedback and recognition came from participating in game jams – specifically, the yearly Something Awful Gamedev Challenge. The theme of the first challenge that the team entered – “You can’t stop [blank]” – helped coax Icarus Proudbottom into existence in his first game, Icarus Proudbottom in The Curse of the Chocolate Fountain. Three years later, the duo was hard at work on Starship Captain when it came time for 2013’s annual challenge. Vecchitto had been tossing around an idea for a twisted take on classic instructional typing games when this year’s theme was announced – “Subversive Edutainment” – and the combination was too good to pass up. Pausing development on their bigger game, they took a month to create Teaches Typing. Within weeks, Something Awful forum members had circulated the game enough to get the attention of indie game tastemakers, kicking off the first wave of press. Had it been a competition hosted by a less influential community than Something Awful, a cornerstone of internet culture, the odds of getting such swift press attention would have been reduced. Tip 1: Join influential communities and make meaningful contributions. At the same time, Vecchitto admits that his programming abilities were pretty basic for the first game, with subsequent games improving in quality as the team gained more experience. The humor had clearly developed as well – from the one-note Chocolate Fountain to the layered, gag-laden narrative of Teaches Typing that elegantly incorporates gameplay into the story in ways that approach Wolpaw-esque heights of the form. Tip 2: If you make games because you enjoy the act itself, you stand a greater chance of putting in the time required to get good. The actual craft of game development aside, the team quickly realized the importance of building a community and harnessing press attention to build buzz for Starship Captain. Lalli, a web designer and social media coordinator for a publishing company, immediately went into “PR mode” when she realized what was happening with the first waves of exposure for the game. Even though Teaches Typing could be completed in 15 minutes and the team had no additional content to keep users engaged, she set up Facebook pages for both Teaches Typing and Starship Captain, with the hope of retaining fans of the first to possibly become fans of the latter. Tip 3: Harness momentum for your game as soon as you see it. 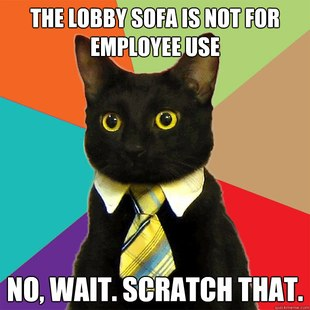 Business Cat doing his thing. The sudden popularity of Teaches Typing wasn’t the first time Vecchitto and Lalli had created something with mass appeal. A few years ago, Lalli posted a picture of Vecchitto’s cat Emilio wearing a miniature tie and collar. Slowly, the image made its way through the Something Awful forums before spilling out into Reddit and then the rest of the internet, where it became known as the meme Business Cat. Although the meme proved to have an uncontrollable (and un-monetizable) life of its own, the experience of unwillingly creating something that provoked such a positive response has undoubtedly informed the team’s process when handling Icarus Proudbottom’s future. In fact, it has borne fruit already – the visually striking Metroidvania brawler Guacamelee! featured Business Cat among other memes, and as a thank-you to Vecchitto and Lalli, the developers included a portrait of Icarus Proudbottom character Jerry the Owl in a Guacamelee! DLC pack. Tip 4: Even if an opportunity doesn’t directly bring money, look for other mutual benefits that can come out of it. 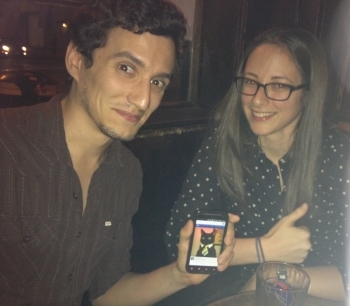 Vecchitto, Lalli and the original Business Cat picture. Unlike the subjects of similar postmortem-style articles, Holy Wow’s story is very much still in progress. Teaches Typing has been invited to Austin’s Fantastic Arcade, to be showcased alongside notable indies like Kentucky Route Zero and Quadrilateral Cowboy. Building on fan interest for the game, Vecchitto and Lalli have more typing misadventures in the works, with episodic updates planned to be released in regular installments. Far from a guaranteed success, yet showing extreme promise, how Holy Wow’s story continues will be fascinating to watch for fellow developers, business-minded types, and – if you’re like me – fans who just want to type more words into the computer.